**2014 CHEVROLET SILVERADO LT**TEXAS EDITION**LIFTED*CRUISE CONTROLS*OFF ROAD TIRES AND MUCH MORE!!! 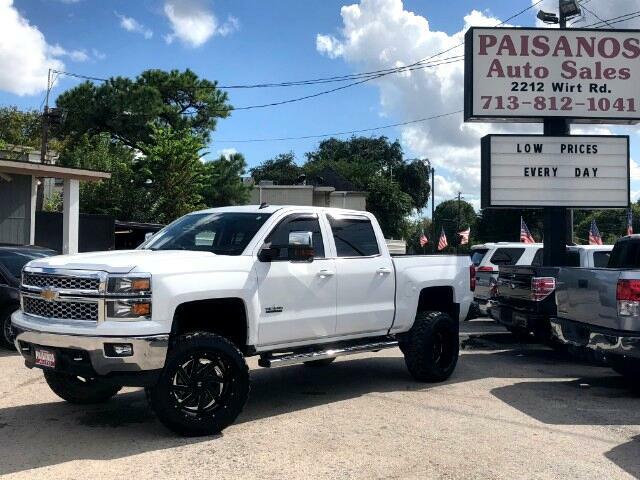 Paisanos Auto Sales is proud to provide another premium auto listing, up for sale we have a gently used 2014 SILVERADO with only 53k miles! This Silverado is as clean as they come! Incredibly sporty look with an incredible ride and drive! Has been well maintained inside and out by the previous owner and is ready to go for its proud new owner! Loaded with Off road tires, Bluetooth and much more!!! CARFAX CERTIFIED!! FINANCING OPTIONS AVAILABLE FOR ALL!! SCHEDULE YOUR APPOINTMENT TODAY!! ***2014 CHEVROLET SILVERADO LT**TEXAS EDITION**LIFTED*CRUISE CONTROLS*OFF ROAD TIRES AND MUCH MORE!!! ***PRICES ADVERTISED ARE CASH PRICES OR OWN FINANCE ONLY! FINANCE FEES MAY BE REQUIRED AND ADDED IF DEALER HAS TO LOOK FOR OPTIONS TO FINANCE THE CUSTOMER. *** WE ONLY SELL VEHICLES THAT HAVE CLEAN TITLES ...... ALL PRICES ARE NEGOTIABLE WE ARE VERY HAPPY TO MENTION OUR A CATEGORY BBB RATING ...... WARRANTIES AVAILABLE WITH EVERY VEHICLE....... OTHER FEES MAY APPLY SUCH AS FINANCING, REGISTRACION, INSPECTION, DOC FEE, PRICES ARE SUBJECT TO CHANGE WITHOUT NOTICE! SEE DEALER FOR DETAILS!! !